Wine Coolers Are Really "Cool"
A few years ago, my brother had his kitchen remodeled. I will have to say it was beautiful (and I was jealous). 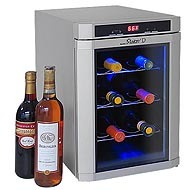 He had a built-in under counter wine and beverage refrigerator that I was particularly impressed with. My thoughts at the time were, "I want one of these!" and "I need to find out more these wine cooler thingies." I want to briefly note that a wine refrigerator is designed for a shorter storage period for wine bottles (less than a year), while wine cellar cabinets are for those wines requiring aging. Premium wines require specific conditions and controlled temperatures (optimally between 52° and 59° F or 12° and 15° C) and humidity settings (70% is recommended) to keep their flavor. Stored and aging wine needs to be kept away from heat, sunlight and free from excessive vibration. Some experts believe that excessive vibrations disturb the natural settling of sediments in the wine, which may affect flavor and clarity. The bottles need to be kept at the correct angle (to ensure that the cork is in contact with the wine, preventing it from drying out). The number of wine afficianados and collectors are growing. 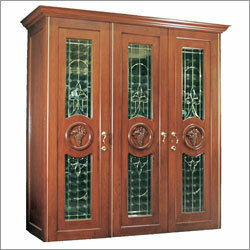 To cater to these consumer's growing wine collections, many beautiful wine coolers have been designed. These can range from a simple refrigeration unit that enables the wine connoisseur to keep valuable wine bottles separate from the food refrigerator (which has an inside temperature that fluctuates too much) to a large wine storage cabinet, which also can be a magnificent piece of home decor. Many modern kitchens have under counter wine refrigerators, and this is something to consider when having any rennovations done. Just remember that you need to find a location for your wine cooler away from any heat sources or far from a dishwasher or disposal (to avoid the vibrations those will cause). You also will want to plan for the proper space required for ventilation. Though some experts believe that too much light can damage wine (and don't recommend a glass door wine cooler) there is no real evidence that this is true. So, the best recommendation I can give you on that is to just don't use a glass door unit where it will getstoo much natural light, and you'll probably be ok. And then, if you drink your wine really quickly (hehe) there's no problem. As for wine cellar storage cabinets, when I started to look into this subject, I was truly amazed at the variety and craftsmanship of wine storage furniture. Just about any room of the house can be a potential spot for a wine chilling or cooling cabinet. The top brands appear to include Avanti, Haier, Eurocave, Marvel, Danby, Vinotemp and a few others. There are shiny stainless steel or aluminum designs, as well as traditionally-styled cabinets and credenzas constructed of oak or mahogany. Some of these represent a substantial investment, but you won't have any problem finding a style that suits your home - there are many to choose from and some offer customized options, such as a choice of finish for the wood crafted furniture models. You might be a practical person who's thinking, "I don't think I would spend my money on a luxury wine furniture cabinet." But maybe you know someone who buys fine wines...believe me, they would love to have a wine refrigerator or wine cooler - or better yet, a wine cellar cabinet. So, whether you just want to chill with your friends and have some wine or you have invested in premium wines that need time to age in order for them to come into their prime, wine coolers, wine refrigerators and wine cellar cabinetry are making for a new "cooler" world for wine lovers. Next topic: Grills - Gas, Charcoal or Electric? Yahoo! Digg Google Reddit del.icio.us Stumble It!